Every now and then, it helps to dig through the past in order to think about what’s going on in the present. So, let’s rewind back to 1920’s Germany. 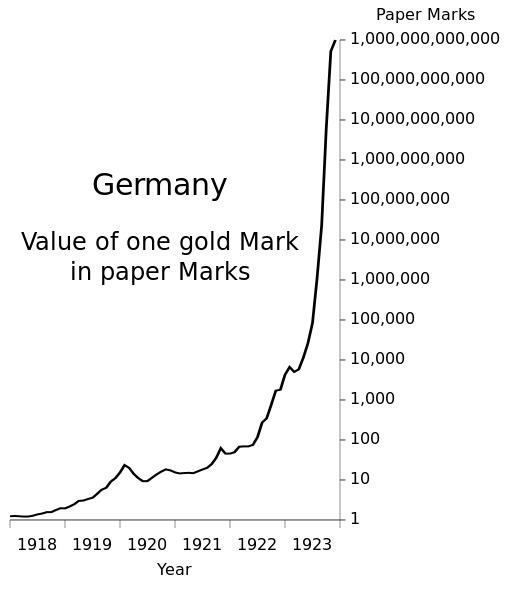 Back then, the country was stuck in a less-than-ideal economic situation after the suspension of the gold standard and Kaiser Wilhelm II’s failure to pass an income tax to help pay for World War I. To deal with the huge debts left over after the Great War, then-president of the country’s central bank, Rudolf von Havenstein, printed up a ton of money. Unfortunately, that idea backfired. 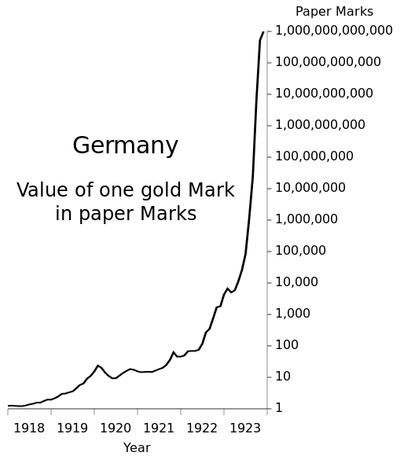 It led to skyrocketing hyperinflation, economic breakdown, weaker institutions, and a destabilization of German politics. The key thing to remember here is that, at the time, basically everyone believed that the rate of inflation and money supply had nothing to do with each other. 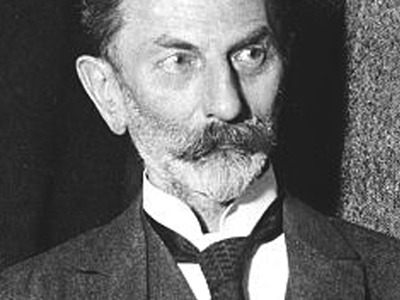 Even professionals like Havenstein believed that to be the case. But, anyway, what does any of this have to do with the present? In a recent note to clients, CitiFX’s Gregory Marks invoked this little history lesson about Havenstein to shut down policymakers’ implementation of negative rates. He argues that just as a smart, professional policymaker like Havenstein was operating under a false assumption, so, too, might the current policymakers as they continue to experiment with negative rates. “In other words, the lesson here is that, unfortunately, people believed in the efficacy of a completely irrational policy because it was put in place by a qualified and experienced policymaker instead of questioning the common sense merit of its possible outcome,” he wrote in the note. DoubleLine FundsThe proportion of global GDP governed by a central bank with negative rates is on the rise. Various countries, including Switzerland and Japan, are currently experimenting with negative rates in an effort to stimulate growth. And while the US isn’t quite there yet, rates are at historically low levels and Fed Chair Janet Yellen hasn’t ruled out anything yet. 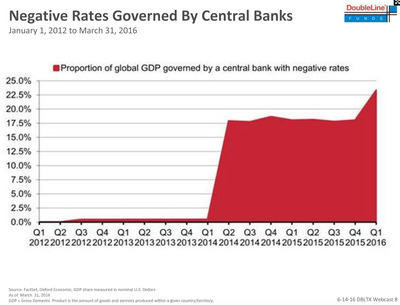 But, since there’s virtually no precedent for negative rates — no one really knows what will happen. There are laws that prevent the medical industry from adopting experimental procedures before they become, well, less experimental. To not have those laws in place would be dangerous. Experimental procedures can produce unintended consequences and their efficacy must be rigorously tested before wide release and adoption. So as a society, we do not let doctors perform experimental procedures on everyone who walks through the hospital doors. Yet for some reason, there are a lot of PhD holders from a different industry who are doing just that to entire nations and economic zones. This isn’t a theoretical petri dish. It’s the global economy.